As digital marketers, we’re spread thin — and we don’t often make time to translate our analytics and reporting into action. Today, we’re launching a whole new series of email alerts to translate more of that data into awareness and action. At Rival IQ, our mission is to simplify data-driven decision making for you. Over the last few years, one key part of realizing that mission has been automating the discovery of notable activity in your landscapes — and proactively delivering those insights as alerts, right into your inbox. Though we know that email alerts are a powerful part of your Rival IQ experience, we’ve heard you when you said that we could do even more. 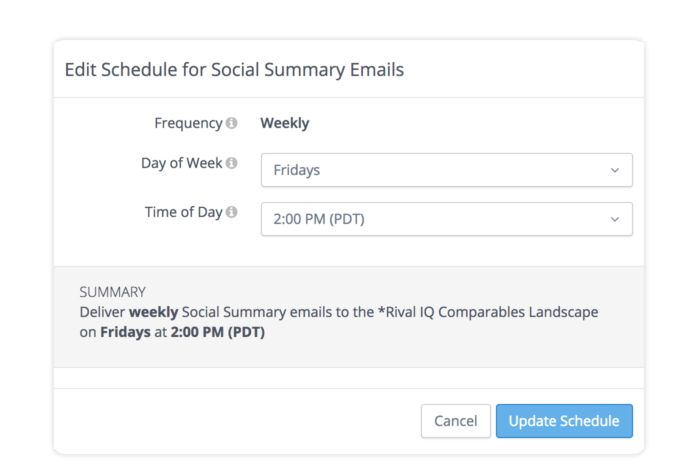 Today, we’re excited to announce a new wave of alerts and delivery configuration in Rival IQ. With this release, you’ll gain a host of new automated insights covering social media competitive awareness and changes in your own web traffic and search rankings. And, to ensure you get only the alerts you want, we updated our alerts settings to enable you to customize which type of alerts you receive via email. We even have new scheduling options, too. Let’s dig in! But first, won’t you help us spread the news with a Tweet? One way to understand your competitors’ strategies and direction is to look at where they’re focusing attention. With each of our newest competitive social alerts, you’ll gain a glimpse into your competitors’ priorities. This new Likely Boosted Post alert brings Boosted Post Detection, one of our customers’ favorite features, straight to your inbox. When our machine learning finds a Facebook post that was likely boosted, we’ll let you know. If your competitors boost lots of posts, we’ll only send notifications for their bigger boosts. 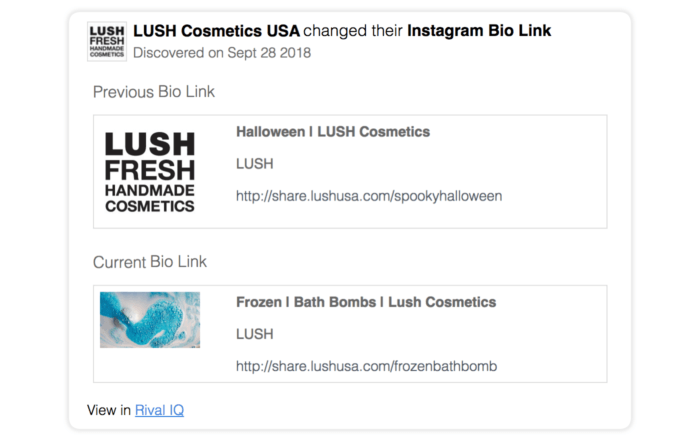 When it comes to focusing attention on Instagram, the Bio Link is the primary way brands can direct traffic to their own sites. To help you understand your competitors’ focus, we monitor their Instagram Bio Links and notify you of any changes. Of course, just giving you a link would only be partially helpful, so we track down the page title, meta description, and preview image to save you time. Plus, we’ll keep the history of these changes for you, so you can easily review trends in how a competitor uses their Bio Links. Can't wait another minute for new alerts? Current customers can jump right into these new alerts by enabling them in the Alerts Setting panel in your Rival IQ account. We know how challenging it can be to really master Google Analytics — it’s a powerful, complex platform. In talking with so many of you, we’ve learned that you feel the same pain that we do as marketers: you want to understand the “whys” behind changes and improvements in your web traffic without having to dig. With our new Google Analytics Alerts, you’ll leave the digging for trends to us. You’ll get a notification straight into your inbox when we notice large traffic increases to your site. And, to get your alerting just right, you can even pick exactly which segment of your traffic you want us to monitor. With our landing page alert, you’ll find out when a new blog post or product page is doing unexpectedly well. When we detect a large increase in entrances to any page on your website over a 30-day period, we’ll generate an email alert. We’ll also break down exactly where this traffic came from in that alert. In the example below, Acme Co. saw a nice traffic bump to their careers page—just what you want when hiring. With our new traffic source alert, you’ll learn when a new influencer or referrer is driving new traffic to your site. When we detect a large increase in new sessions from a source/medium over a 30-day period, we’ll generate an email alert. We’ll also let you know exactly where this traffic landed on your site. In the example below, Acme Co.’s Google/CPC (that’s Google Ads) traffic jumped by more than 20% last month—that’s a good indicator that they should keep doing more of whatever they were doing to see this big traffic increase. Ready to see these new alerts in action? Join us for a free webinar all about these new alerts, or sign up for the recording to watch on your schedule. Our new SEO alerts use keyword ranking data from our partnership with SEMrush so you can better understand how your content creation and promotion efforts are paying off for search rankings. Did one of your pages improve substantially in the search rankings? We’ll send you an email about it. To help keep the noise down, we’ll only send if your new ranking is in the top 10 results for that keyword. In the example below, Bramble Berry recently improved their rankings on two different search phrases, moving onto page one of Google for both. For “rosehip seed oil,” they moved into position 9, up 10 slots from position 19, with a product page for a rosehip seed oil product of theirs (surprise!). We’ll also send you an email alert whenever we detect that one of your pages has decreased substantially in the search rankings. To help minimize inbox noise, we’ll only get in touch either when you drop 5 or more spots within the top 10 results — or if your new ranking moves out of the top 10 results for that keyword. In the example below, Starbucks lost position in the rankings for the search term “coffee”, dropping 5 spots to number 9. That’s a big drop for such an incredibly high volume term. But wait, there’s more! We’ll send you an email alert whenever we detect one of your pages ranking for a search that it didn’t rank for previously. To help keep things relevant for you, we’ll only email if your new ranking is in the top 10 results for that keyword. In the example below, Benefit Cosmetics moved onto page one of the search rankings for three different terms. It’s important to note that Benefit may rank for these phrases with other pages on their site, and that this alert is calling attention to new pages ranking for the same phrase. In this release, we’ve added seven new alert types, bringing the total alert and summary email types in Rival IQ to 15! 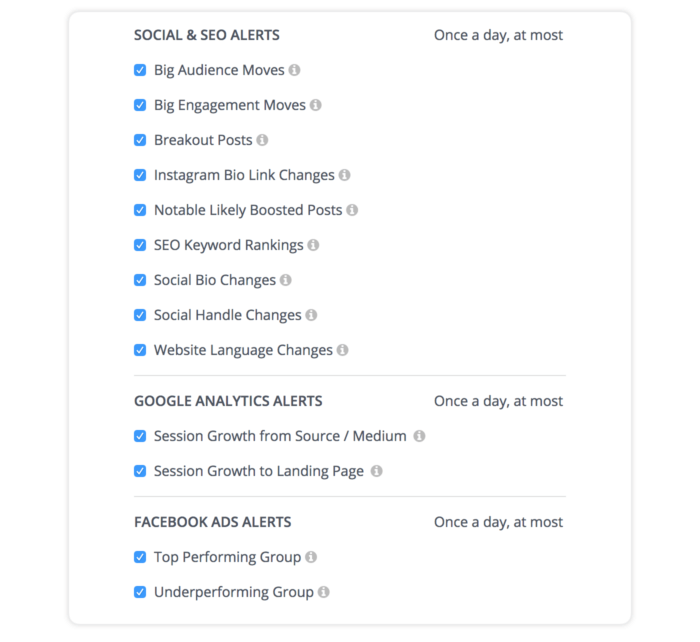 These alerts cover everything from social to metrics, Facebook Ads to messaging, and more. And, we’ve improved our notifications settings: you can now select exactly which types of alerts you want. Plus, for our weekly update emails, you can now choose the day and hour at which we generate and send this mail. With so many new (and existing) alerts, we know it’s important for you to be able to configure exactly which alert types you’d like to receive. For example, if you don’t care to see alerts about large Twitter follower growth from a competitor, you can disable the “Big Audience Moves” alert within your landscape. If you disable all of the alert types within a single class of email (like the Social and SEO Alerts pictured below), you won’t ever receive that email. Every week, we send two insight-packed emails regarding your landscape: one summarizing your social performance for the week, and another summarizing Twitter Mentions. With this release, you can now choose the day and hour of delivery for each of these mails. Want everything on Monday at 8am? You’ve got it! All of our paying customers have access to these features now, and there are a few ways to learn more about this release. Register for the upcoming Alerts webinar on October 16th. We’ll send a recording, so register even if you can’t make it. Read the release notes for more details about each of the new alerts. If you’re ready, go set up and adjust your alerts in your Rival IQ account via your Alert Configuration page in Rival IQ. If you’re loving these new features, let us know on email or Twitter with a Tweet. We’d love to hear from you!